The Healing of the Blind man – without courage there will never be healing. Synopsis: What is the most important part of the healing of the blind man story? It is undoubtedly the courage of the blind man and how because of his courage he was brought to full enlightenment and healing. Our healing in Christ will not proceed to completion without personal courage. It does not matter how talented, intelligent or knowledgeable you are, or whether you have more self control than most and your life is in good order or not – without personal courage and willingness to stand up and be a Christian in our post Christian age (a misnomer term, there has never been a "Christian" age, since the world has always been against Christ), you will not be healed of your passions and sins and achieve perfection. The dialogue of the blind man with the Pharisees of his age (every age has them), shows how we incrementally become wiser and sounder in soul as we react to whatever the world brings to is with courage, and with what we know at the time. This is an "every man" kind of story. The blind man had no special talent, nor did he have complete knowledge (his answers showed him growing in knowledge), but he was courageous, and because of this, he gained not only physical eyes, but also spiritual ones. Anyone who is tempted to cave in to the political correctness of this age, which demands certain ways of thinking, speaking and acting, needs to ponder the healing of the blind man in great detail. John 9:1-38 1 And as Jesus passed by, he saw a man which was blind from his birth. 2 And his disciples asked him, saying, Master, who did sin, this man, or his parents, that he was born blind? 3 Jesus answered, Neither hath this man sinned, nor his parents: but that the works of God should be made manifest in him. 4 I must work the works of him that sent me, while it is day: the night cometh, when no man can work. 5 As long as I am in the world, I am the light of the world. 6 When he had thus spoken, he spat on the ground, and made clay of the spittle, and he anointed the eyes of the blind man with the clay, 7 And said unto him, Go, wash in the pool of Siloam, (which is by interpretation, Sent.) He went his way therefore, and washed, and came seeing. 8 The neighbours therefore, and they which before had seen him that he was blind, said, Is not this he that sat and begged? 9 Some said, This is he: others said, He is like him: but he said, I am he. 10 Therefore said they unto him, How were thine eyes opened? 11 He answered and said, A man that is called Jesus made clay, and anointed mine eyes, and said unto me, Go to the pool of Siloam, and wash: and I went and washed, and I received sight. 12 Then said they unto him, Where is he? He said, I know not. 13 They brought to the Pharisees him that aforetime was blind. 14 And it was the sabbath day when Jesus made the clay, and opened his eyes. 15 Then again the Pharisees also asked him how he had received his sight. He said unto them, He put clay upon mine eyes, and I washed, and do see. 16 Therefore said some of the Pharisees, This man is not of God, because he keepeth not the sabbath day. Others said, How can a man that is a sinner do such miracles? And there was a division among them. 17 They say unto the blind man again, What sayest thou of him, that he hath opened thine eyes? He said, He is a prophet. 18 But the Jews did not believe concerning him, that he had been blind, and received his sight, until they called the parents of him that had received his sight. 19 And they asked them, saying, Is this your son, who ye say was born blind? how then doth he now see? 20 His parents answered them and said, We know that this is our son, and that he was born blind: 21 But by what means he now seeth, we know not; or who hath opened his eyes, we know not: he is of age; ask him: he shall speak for himself. 22 These words spake his parents, because they feared the Jews: for the Jews had agreed already, that if any man did confess that he was Christ, he should be put out of the synagogue. 23 Therefore said his parents, He is of age; ask him. 24 Then again called they the man that was blind, and said unto him, Give God the praise: we know that this man is a sinner. 25 He answered and said, Whether he be a sinner or no, I know not: one thing I know, that, whereas I was blind, now I see. 26 Then said they to him again, What did he to thee? how opened he thine eyes? 27 He answered them, I have told you already, and ye did not hear: wherefore would ye hear it again? will ye also be his disciples? 28 Then they reviled him, and said, Thou art his disciple; but we are Moses' disciples. 29 We know that God spake unto Moses: as for this fellow, we know not from whence he is. 30 The man answered and said unto them, Why herein is a marvellous thing, that ye know not from whence he is, and yet he hath opened mine eyes. 31 Now we know that God heareth not sinners: but if any man be a worshipper of God, and doeth his will, him he heareth. 32 Since the world began was it not heard that any man opened the eyes of one that was born blind. 33 If this man were not of God, he could do nothing. 34 They answered and said unto him, Thou wast altogether born in sins, and dost thou teach us? And they cast him out. 35 Jesus heard that they had cast him out; and when he had found him, he said unto him, Dost thou believe on the Son of God? 36 He answered and said, Who is he, Lord, that I might believe on him? 37 And Jesus said unto him, Thou hast both seen him, and it is he that talketh with thee. 38 And he said, Lord, I believe. And he worshipped him. The Sunday of the Blind Man. What must I do to be saved? Synopsis: The story of the healing of the blind man who washed in the pool of Siloam is a primer on what we must do and must not do – to be saved. We discuss some very important dogma presented at the beginning of the reading (what does it mean when is says Jesus "passed by" – it is something very specific, personal and important, questions abut sin, what our Lord's important statement about work during the day means), and then we look at the character of the blind man, and the ruling Jewish elite. A clear pattern emerges of the things WE must do, and the things that God will do it we do these necessary things. Sunday of the Blind Man. There is no salvation without good character. There is no salvation without courage. There is no salvation without good character. There is no salvation without courage. Brothers and sisters, during this Paschal season the Gospels have taught about enlightenment and the process of salvation. Today’s Gospel is another example, and it speaks of something indispensible that we must supply, the same thing that was present in Saint Thomas and the Myrrhbearing women: Character. You cannot be saved without good character. You need it to follow the commandments. It has to be in the heart. This blind man was a good man. We can see his character very vividly when the Jews questioned him about his healing. We observe a man who really knew nothing about Christ except his name, who on the greatest day of his life was being accosted, questioned and attacked with hostility, even from his own parents. He showed great purity and honesty and courage and not a little bit of humor as well. We need to have character if we’re going to be saved, and this man shows the kind of character we must have. This man’s character overcame the obstacles newly presented in his life, because of the disingenuous and aggressive questioning of the Pharisees and Sadducees after his healing. They are much like the “press”, the mob of people who surrounded the house and made access to Christ difficult for the Paralytic. The paralytic was lowered through a roof because of the press, and symbolically this means that the world makes it difficult to be a true believer. The world tries to impede us, and this is exactly what’s happening here. The Pharisees, because of their jealousy, blindness, anger and hatefulness, were trying to find something to condemn Christ because he was merciful to one of their own. Remember, the Pharisees controlled many things. If you were put out of the synagogue, then you were basically blacklisted. It would mean bad things for your well-being, your business contacts, and everything else. The Pharisees had made it be known that they were extorting from their own people obedience to them, and they had forbidden that anyone could say that Jesus is the Christ (the Messiah), otherwise they would be put out of the synagogue. Let’s trace what happened to this man, and let’s learn how we can be like him. Jesus passed by. Those words are not by happenstance. Jesus passed by. In another place He also was on a journey, and he referred to Himself as a Samaritan. No one could help the man who was by the side of the road, bleeding and half dead, not the Levite, nor the priest. No one could help. So Jesus, not by happenstance, passed by. This passing by indicates His incarnation, His coming to earth to heal us. And we are all like the man by the side of the road, left half dead. We are all like the man who is born without eyes, blind, or like the paralytic, or like any many examples. Each of those persons is us. And it is not by accident that Jesus passed by this man who was born blind. Isn’t it remarkable how much is contained in the Scriptures? Just a couple of words: Jesus passed by. And it indicates the whole economy of our salvation: The incarnation of the Son of God. Jesus became incarnate so that he would live the life that we must live to know God and make us capable of living that life. He became incarnate so that He would address our every need, whether it is that we are blind or halt or lying by the road half dead because of our sins. Whatever our need is, He comes to help us with it. And here is how He does it: He made a moist lump of clay from his spittle and the dust of the ground. And he did something that we know in our tradition to be true. He made eyes for the man. He didn’t just smear clay over him. He made little balls and put them in empty sockets. The man was born without eyes. Our Services, our Tradition makes this very clear. Now, as an aside, let us say something about this man who was not only blind, but born without eyes. It is one thing perhaps to help someone that has some problem with his eyes to see, such as Paul who had a problem with blindness on the road to Damascus. How can you make a man to see who does not even have eyes? Only God can do this. No wonder the people were saying: ‘He looks like him’, because they remembered someone who didn’t have eyes. What does this mean for us? There’s nothing impossible with God. If he can make a man see who doesn’t even have eyes, don’t you think that he can help you in the things that you need in your life for which you see no solution? Many times this story has given me much comfort because there are a lot of things that I just don’t see the solution to; I have no idea how it’s going to get done; I have no idea how things are going to get better. But God knows. A doctor would think, in order to help a man see, first there must at least be eyes to work on. The Lord doesn’t even need eyes. There is nothing that the Lord lacks. And there is nothing that the Lord cannot give. So let us believe this. Now, by the way, you don’t just say, okay, I will just snap my fingers, now I believe this, that’s right, I have perfect faith now. No, faith is grown, and we see in this story that the blind man’s faith grew. And how did it happen? The Lord makes his eyes and tells him go to the Pool Siloam. This plainly prefigures baptism. With baptism comes healing. The man was not healed until after he washed. If he had not gone and washed, he would not have been healed. Remember the story of Naaman, the Syrian? And he ordered some great thing for the prophet to tell him to do and. And all he said was just go to the Jordan and dip yourself seven times. He wanted something great, something big and he wouldn’t do it until his servant basically said, you’ve got to do it. And then he was healed of his leprosy. The same thing happened with this man ; he stumbled over to the pool of Siloam, washed and came away seeing, because the waters of baptism cleanse and heal. They would not have cleansed and healed if he did not approach them. And his character is what caused him to the healing waters – his guilelessness and obedience. We’ll see much more strong character traits in just a moment. So now the whole town is all abuzz, and the Pharisees are angry because they’re so full of hatred, and one of their own is healed, and all they can think of is keeping control. And they’re going to keep control by continuing what has been done from time immemorial where a group of people tries to terrorize another group because they have some power. And in this case, the power was to cast out of the synagogue, to ostracize. And they still couldn’t believe. So they called his parents. Look what his parents did: How shameful! His parents admitted that he was their son, begrudgingly, but then they immediately passed to him: ‘he is of age; let him explain’. May God not have it happen that any one of us, if our children were healed in such a way, that we would act like this. We should say: To God be glory. Of course he was healed by God. But they were afraid that they would be put out of the synagogue. So then they called the man and questioned him again, and here is where his character shines forth. Brothers and sisters it takes courage to be a Christian. You can’t be saved without courage. It won’t happen. It takes courage to approach your own sins. It takes courage to live the Christian life in the face of others who want you to live a different kind of life. The world, and worldly Christians tell you to go ahead and be Christian but just don’t be too crazy about it, just make sure that you allow other people to have their space, keep an “open mind” about morality. The only thing our world is not tolerant about is if someone actually believes something is right and wrong. Otherwise other than that, they tolerate everything. This is not the Christian way, which absolutely, unequivocally knows and proclaims that there is right and there is wrong. There is a way of life and there is a way of death. There is a God and there is a devil. And there is a right way to live and a wrong way to live. There are right opinions to have and wrong opinions to have. And none of this ever changes. And what did the man say? We must understand the way the Scripture says it. He says, whether he be a sinner or not, I know not. That doesn’t mean he didn’t know who Jesus was, or didn’t know he was a sinner. It’s like saying he was dismissing them, since to even consider Jesus too be a sinner, given the evidence of his actions is ridiculous. A moment later, he tells them: “We know that God does not hear sinners. “This is where the man started to really have, as it were, his eyes opened, his spiritual eyes opened. Seeing the depravity of the Pharisees made him much more see the goodness of Christ. Can you imagine how angry the Pharisees got at that point? Can you imagine the courage to say such a thing? It was automatic that he was out after that. Automatic. And he knew it. So those clinging to power say a few other things: “Thou was altogether born in sins” and other things, and they cast him out. How many of us would have acted like that? Now, put yourself in his position. He’s been a blind man and a beggar for all his life. This is his opportunity for the first time to be part of society. Because when you are blind and when you are lame and when you have some disease, you’re basically pushed away from society in that culture. This was his opportunity now to be part of society, to no longer be so hungry and alone. And yet, the Pharisees were asking him something that he could not do. He could not lie about what happened, because his heart told him it was God who healed him. And so he was courageous. Question yourself. Would you do the same thing? This is how salvation is won, brothers and sisters: Christ passes by; he comes to each one of us, and we are baptized, and then the living begins. The victorious living. And doesn’t mean it’s always going to be easy. Sometimes it’s very difficult, and there are going to be people that are oppressing us. This is also true in business today. Businesses try so hard to get you to conform to their sort of false religion. Don’t fool yourself. They all have a false religion. And they want you to sort of have opinions and sort of fit in with everyone else – usually this amounts to being silent about immorality. This is not who we are. We should be like the blind man, who gained his sight and was courageous in speaking the truth. This is what this Gospel teaches: You can’t be saved without courage. God will instill in you the ability, but if you don’t have good character, then you’re lost. God can help you with your sins. God can help you with strengthening your will, but God will not give you desire. You must have desire. He will help you. He will strengthen you and in so going from one good thing to the next, you will be filled with more zeal. God will not give you desire. God will not give you good character. You must provide these works. This is in another place: The one who had one talent and buried it in the earth. What did he say to the Lord? Well, you know, you reap where you do not sow and you gather where you have not strewn. And the Lord said, yes, you are right, exactly. And what that means is that the Lord will give you grace, but you must become good. He’s not going to become good for you. You must become good. God gives you all the tools, all the ability. Examine your character and the places in your character that are deficient. Improve. If you tend to be dishonest, this in many ways is much worse than some carnal sin. God can help you with sins. But as for defects of character – you must spend a lot of energy on these. And if a person does not really desire to be saved, even though they say they want to be saved, even though they say they’re Orthodox; then they will not be. Our inner disposition is shown by the way we live and by the way we think and by the way we speak and by the priorities we have. God will not give you these priorities. God will give you the ability to fulfill these priorities. And this we see in the blind man. God did not make this man good. God doesn’t make anybody good. God helps us to become good. And this man was good and courageous and because of that, he found God. Let us be like him. Amen. Transcribed by the handmaiden of God Helen. To receive regular mailings of sermons, and scriptural and services commentary and other things throughout the church year, read our blog “Redeeming the Time” (http://www.orthodox.net/redeemingthetime). You may also subscribe to the RSS Feed or receive its postings by email. Our parish Email list ( http://groups.google.com/group/saint-nicholas-orthodox-church) also has all the latest postings from our website and blog; everyone is welcome to join. All rights reserved. Please use this material in any edifying reason. We ask that you contact St. Nicholas if you wish to distribute it in any way. We grant permission to post this text, if completely intact only, including this paragraph and the URL of the text, to any electronic mailing list, church bulletin, web page or blog. 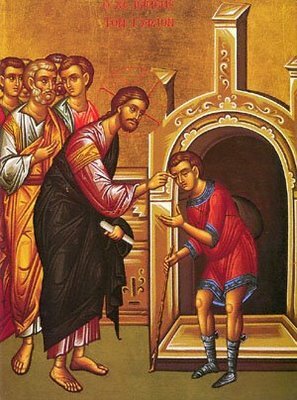 Homily:Sunday of the Blind Man. 2010. Audio. 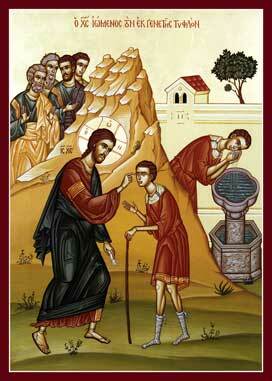 Homilies about the Sunday of the Blind Man. All these homilies are in audio, with one in video. Recently an angel has volunteered to start transcibing homilies, so God willing, more will appear in text form. Why was the man born blind? The scripture mentions two possibilities. What is the tradition concerning the "eyes" of the man born blind? Many of Christ's healings recounted in the Scriptures consists of TWO healings, sometimes in a different order. What are these, in general terms? Describe these two healings of the blind man, in the order they occurred. Give at least one other example of a "double healing". 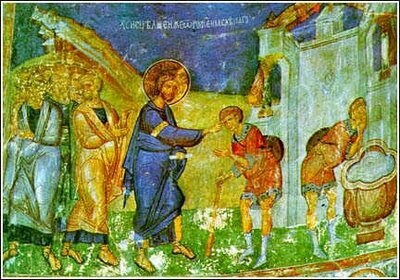 Why were the Jews upset about the healing of the blind man? What were the stated reasons, and what were the real reasons? The healing of the blind man shows in a striking way that God gradually illumines a soul. This event was recorded for our benefit, and together with many other events and recountings, helps us to see the diverse manner in which Christ heals and illumines a soul, and also serves as an instruction to us, who are also being gradually illumined, more or less according to our reaction to God's grace. The illumination of the soul has been a constant theme since Pascha. Describe at lease three other examples of this most important action of the grace of God, which the church has recently contemplated. What may these recountings teach us? The trip of the blind man to the pool of Siloam cannot be overlooked, as it is very instructive to us. What is this trip a model for? Describe the trip, and don't be so laconic! We must understand the difficulty of this trip, if we are to benefit from it. 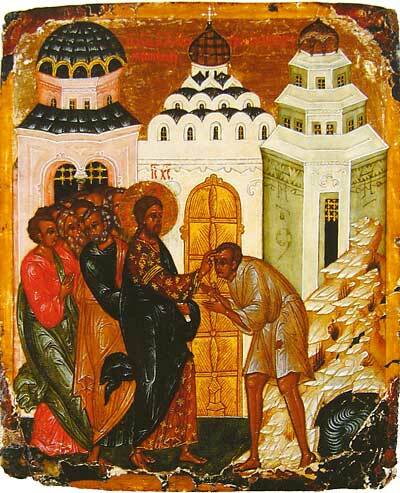 You are currently browsing the archives for the 6th Sunday of Pascha – The Blind Man category.